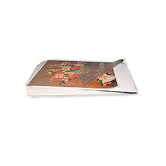 These laminating pouch boards are 3/16" foam core board with a hinged laminating sheet on top. The boards and the laminating sheet have a thermally activated adhesive, so you can laminate and mount in a single pass. Great for posters, signs, trade show banners, sales presentations, photographs, and more. Clear, high gloss laminate film attached to a 3/16" white foam core board. Mounts and laminates in a single pass. Matte finish laminate film attached to a 3/16" white or black foam core board. Mounts and laminates in a single pass. Matte laminate film attached to a 3/16" white or black foam core board. Mounts and laminates in a single pass.